ARTIST LOFT STUDIOS CAMBRIDGE - MY FIRST YEAR Thank you for visiting my studio this year & braving the stairs, as well as the unknown, to visit with an English artist newly-arrived on the Eastern Shore. With the help of my husband, Jamie Baldwin, I have welcomed visitors from all over the USA & Europe, every Second Saturday, & enjoyed stimulating conversations about art & travel & everything else in-between (like the WEATHER)! 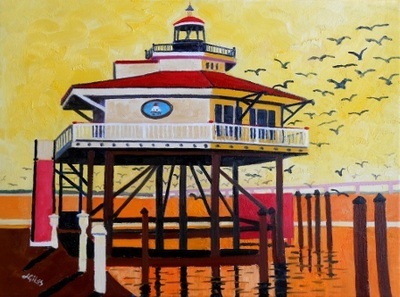 Interest & sales of my recent Hooper Island & the Eastern Shore paintings have been phenomenal. One of them was even shipped to a collector in London. 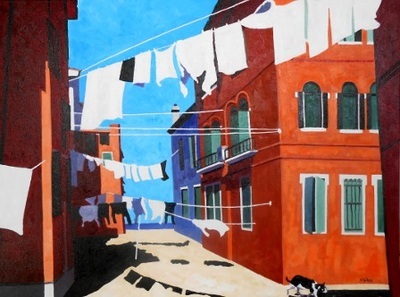 However, I was very happy that my first big sale in Cambridge was a painting of a washing line in VENICE to a collector family from Virginia. It was very exciting to see the painting hanging in their house above a specially acquired matching table. This year I have received several commissions, including The Maldives & Padstow England, but the most delightful was a portrait of two DOGS that truly challenged my painting skills. It ended as a "labour of love" ............ Woof. 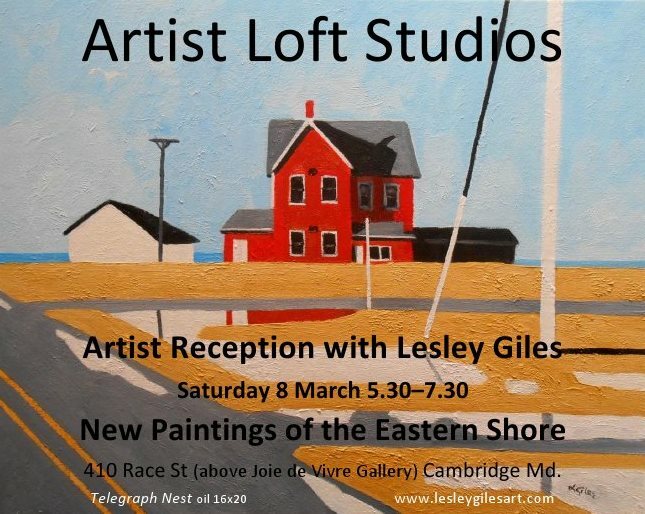 Of course, if it wasn't for Joy Staniforth, owner of the first Cambridge downtown art gallery Joie de Vivre Gallery, I wouldn't be working in my Artist Loft Studio. Her support has been astounding! Just this week she brought Peter Franchot, the Comptroller of Maryland, & Mayor Victoria Jackson-Stanley to visit the studios. I am touched by the welcome extended to me by local artists. Also the Cambridge Main Street organization, Attraction Magazine, Tidewater Times, Beach to Bay Times & Dorchester Banner and Star have all "gone the extra mile" to help publicize the studios. If you are on the Western Shore I am exhibiting with the Maryland Federation of Art in their "Holiday Show" at 19 Main St, Annapolis until the end of the year. Also "small works" at the Annmarie Arts Center in Solomon's Island continues through 5 January 2014. The studio is open to the public every Second Saturday which is 14 December from 5-8 (also by appointment 386 405 2329). 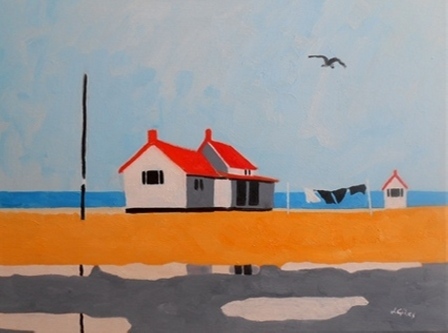 I am offering "Holiday Specials" on archival paintings to make room for new work. For that "Special Gift" you may like signed prints of my paintings or signed copies of a new book "Golf Sayings" by Bradford G Wheler that features my paintings. 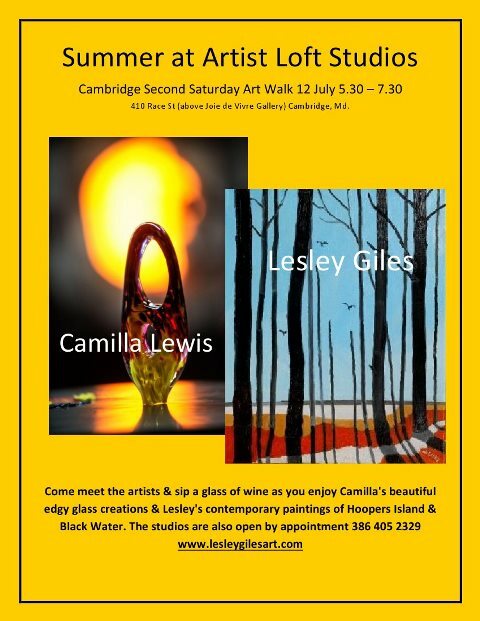 See you soon for WINES Lesley Giles Please LIKE my page Lesley Giles Artist on Facebook to catch up on my new work and exhibitions! This email is being sent to you because you signed my address book at Artist Loft Studios. I understand that you may no longer wish to receive information from me. If this is the case then please press "reply" with the words "not interested".